EE TV is something of a surprise. Out of nowhere EE pops up and produces a credible box that has been excellently designed and has a likeable, responsive and helpful user interface. With a few more streaming video apps, EE TV could show YouView a thing or two. Since Freeview launched back in 2002, there has been no shortage of set-top-boxes on which to record your favourite TV shows. Once upon a time, particularly before on-demand viewing and streaming took hold, this was a much more necessary, but these days people can forget about making recordings and catch up online in their own time. So what EE TV aims to give people is an experience where everything is built in to one box. The technical feature worth mentioning here is that it supports HTML5, which allows the box to connect with all manner of online services without the need for complicated and bespoke apps. The BBC's iPlayer, for example, works on this system and that's one of the reasons it's so prevalent. Expect much more support for this in the future, and thus, more potential for the EE TV box. The first thing the EE TV asks you for is the password for your Wi-Fi. There are a few reasons for this, but once you've finished the setup you will be presented with a short video that explains the box and its features. This is really nice, and a very good way to get to know your new device. The box is also supposed to have a crack at tuning in channels while you're tapping in your password. In my tests, this didn't work, but perhaps yours will. No matter though, once you've given it your password, it will hunt for channels. This doesn't take long, and the list will scroll before you so you can see what you'll be getting. Once you're tuned, the box will ask you to nominate some channels, six in fact, which will be recorded constantly. The idea here is that if you miss the start of a programme on one of your favourite channels, you can simply return to the start. Because this is always happening in the background, it's really simple to use. The restriction on the number of channels that can be buffered is about the number of tuners in the box. The EE TV is very well equipped. There are six tuners built in here, which are needed for the box to be able to constantly record your favourite channels, as well as stream to phones and tablets. At times, you might feel the need for more than six tuners, but the way Freeview works means that you can use one tuner to record a couple of channels on the same multiplex at the same time. So it's an efficient system. Around the back there's a HDMI output, as you'd expect. The good news here is that the EE TV box can output at 1080p50/60 or 1080i50/60. Although the UK doesn't use either 1080 lines or 60 frames on broadcast TV, you might find it preferable for the user interface and internet streaming, potentially, which could offer much higher rates in the future. On the 1080i50 or 60 setting I get a green bar down the right side of my screen, noticeable in the 1:1 pixel mapping mode on my TV. Switching to the progressive output at 1080 worked much better though. It's also worth mentioning that this box is capable of supporting DLNA. EE told me that, at launch, it didn't want to include it unless it could make it work within the interface. Adding in DLNA, or working with a company like Plex to develop a streaming app for home media might add a lot of extra value to EE TV. There are two features that make EE TV interesting to traditional timeshifters. I've touched on 'restart' already, but in short it allows you to skip back to the beginning of a currently airing programme at the touch of a button. The channel choice that this option is available on is defined by you at setup, and I stuck with the BBC channels and Channel 4. I added ITV too, but I last watched a programme on that network in the early 90s. Replay allows you to jump back through one of your defined channels and catch up on any show over the last 24 hours. Again, it does this by constantly recording your pre-selected channels. It takes up a bit of space on the box, as you can imagine, but the provision of 1TB of storage is generous enough for that not to be much of a problem. You might think that the picture quality of a HD box is a given. In fact it's not, but the quality of the EE TV box is very good indeed. HD channels have a lot more detail than you might expect for over-the-air broadcasts. SD channels look softer of course, and have higher compression which makes the picture look less than stellar, but this is not a problem with the box. HD quality from iPlayer is very good too, although it takes a decent amount of time to start the app and get to a HD stream. Again, this is more down to your internet connection than it is the box itself. You can set a preference to always use HD though, which is worth doing if your network can handle that. Sound quality is good too, the box can pass Dolby Digital out to an amp, or you can opt to send regular stereo if you're just using a TV, especially one that can't handle Dolby Digital. It sounds good, as you'd expect, but I find that as a rule surround sound support on British TV is a bit lacking. If we get Dolby Digital at all, it's too often stereo, rather than surround sound. With that said though, everything here sounds nice through my Onkyo AVR. EE TV can stream to your phone, something I've only seen this on a handful of devices before, and I don't think I've ever seen it done quite as well as the EE box manages it. EE's success here is firstly in the largely problem-free video streams, which run smoothly and in good quality under most conditions. I used 802.11n Wi-Fi to connect the EE box, and the same on my Android phone, and streaming looked magnificent. Apple devices can get HD channels, while Android phones tend not to be able to handle the video streams for that. This is a hardware issue, and not something that EE can do much about. The next reason it works so well is how the app is designed. It's a very close mirror of what you see on the EE box itself, when you're using it connected to a TV. You can access the full EPG, see the other channels in a graphical way, with programme image previews and you can see what's coming up next on your current channel. The mobile apps feel like mini versions of the box, and that's a really likeable user experience. It's also possible to stream recordings to your phone, and a feature I really liked was the option to "flick" a video from the phone to the TV, which then stops it playing on the mobile and carries on where you left off on the TV. It's partly the feature I like here, but it's also how slick it feels to use, and how little messing around there is. If you object to EE's green and yellow branding then you're going to have something of a fit when you see the EE TV user interface. It looks exactly like EE's other products, and while I do respect that continuity, it could also be seen as a bit much. That said though, this is aimed at EE customers in the first instance, and they won't be paying for the box up-front, so EE does have some right to get its brand message out there. For all that though, the consistency is very good. I love the fact that there's a clock in the top right for a few seconds when you jump into live TV, and I also like the way it tells you if you're watching live, or a replay or restart programme. This makes a lot of sense, but it's strange how infrequently that sort of clear messaging gets forgotten on set-top boxes. While EE has made this box clearly branded, it's also put a load of effort into making it work well. So while everything is turquoise and yellow, but it's also very graphical too, there are images for everything, and generic shows like "news" have their own graphics. The presentation is very nice indeed. Tap the left direction key, and you'll see a graphical banner that shows what's coming up on the channel. You can scroll through other channels too, to see what else is on. Pressing the down direction key does similar, but this time on the left of the screen, and shows you a channel list that's scrollable, and displays the currently airing programme on a selection of channels. Again, you can scroll here to see all the tuned channels. EE sees this box as an entry to the home, and also as a platform. It says that it's not getting into the content game, so it wants companies like Netflix and Amazon to use its box as a basis for their services. This is an excellent idea, and staying away from content could make EE TV one of the first boxes to have every service. Of course there are lots of issues around this, and there are some things that the EE box could do, but broadcasters won't allow. For example, you could sync recordings to your phone or watch them over 4G, but this sort of thing is against the rules. It seems reasonable that more and more services will need to join EE TV to keep interest up. If EE can persuade companies to bring their services to the platform, then it should see a boost in interest. The hardware and interface are great, but more services will make it even more attractive. Here's where things get a bit interesting. If you're an EE broadband customer you can get EE TV for free. This isn't without condition, as you might imagine. You'll need to be on EE's services paying £9.95 per month minimum, and you'll have to agree to an 18 month contract. 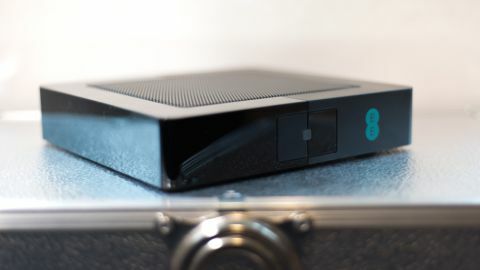 The box has a RRP of £300, which is pretty much comparable with other boxes on the market, plus there's the benefit that EE TV has a 1TB hard drive, which is more than most other boxes you'll buy.